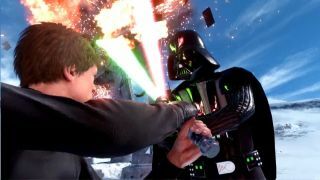 Star Wars Battlefront will support multiplayer action with up to 40 players blasting it out in massive battles between the Empire and the Rebellion. This is what one of those battles will look like. The perspective on the "Walker Assault" on the planet Hoth switches back and forth between the two sides, and works out about as you'd expect: The Empire drops the hammer, and the Rebellion does its best to bob and weave and not get clobbered. There are AT-ATs, AT-STs, TIE Fighters, X-Wings, Speeders, and more; you can fly them, you can drive them, you can even swing a magical laser sword at Darth Vader, if you're "lucky." The video is taken from the PlayStation 4 version of the game, and it looks great. I can't wait to see it running on a high-end PC. Star Wars Battlefront will be out on November 17. Details are up at Starwars.EA.com.